His work is beautiful. 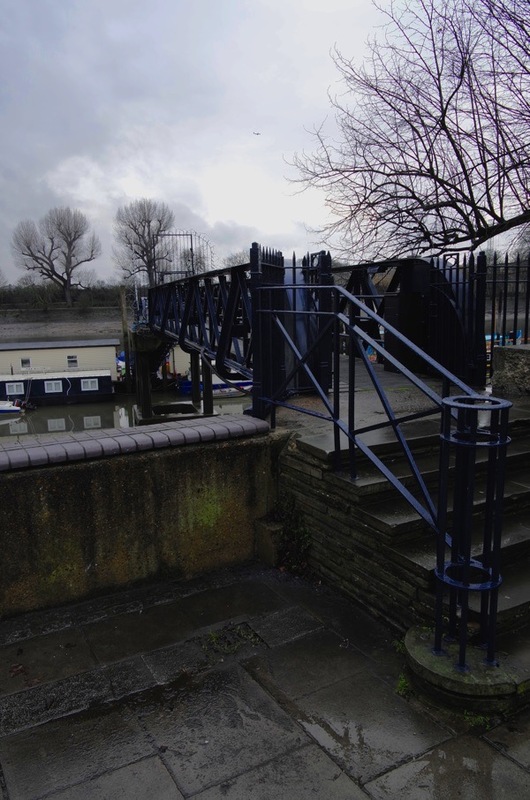 I’m particularly taken with the final work – is it the inlet just west of the Dove before the A4 widening ruined the area? 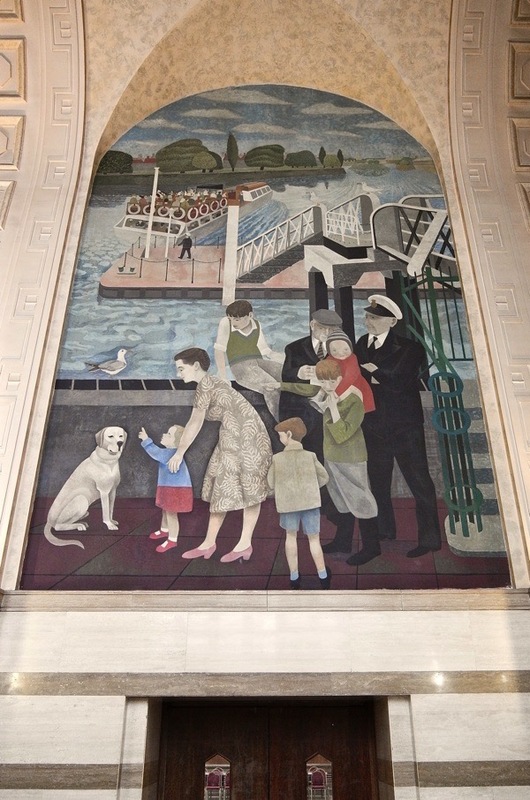 Thank you so much for photographing Alfred Daniels’ murals. I remember them very well from the handful of times in the 60s when yes, the only way to enter the Town Hall was to climb those winged stairs to the main entrance, across the park off King Street. (Our school had reason to attend ceremonies there, & a ~ remarkably imitative ~ painting of mine featured in an art exhibit down in the basement.) I’ve been looking for reproductions online for a few years &, believe me, there’s nothing compared to your photos! BTW: the pier is not Hammersmith, but Dove Pier, &, so I’m told, it aligns perfectly with the Mayor’s Parlor in the Town Hall. And lovers of tv’s New Tricks have seen the interior of the 1939 Town Hall many many times. What beautiful paintings . They really are striking . The gentleman was a very talented artist. These are beautiful. About a thousand times better than the current trend for making hideous bronze statues in a lifelike mode but capturing the spirit of wily old Hammersmith perfectly. These really are exquisite, the man had good reason to be proud! thank you for sharing! Murals! — On-view, “cleaned and restored”, not-slated-for-demolition, enduring and enriching. is a treat. 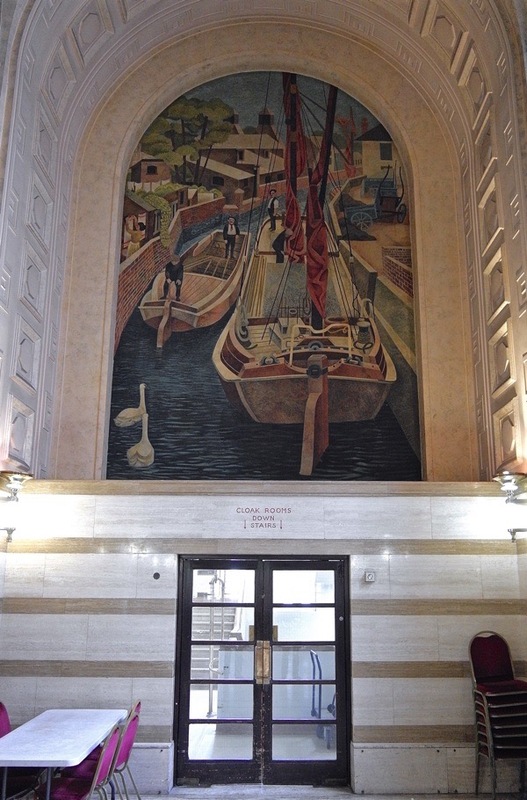 Your recent blog post about his paintings and sketches provoked curiosity and appreciation…..and now the murals. What a legacy. It’s lovely to see these. Thank you. Thanks for showing us these! The mural on the west wall is so attractive that a charity organization might like to use it for birthday or other greetings cards. I’d be happy to buy some if they do! Hanmmersmu Mall and the Dove are favourite places for me. 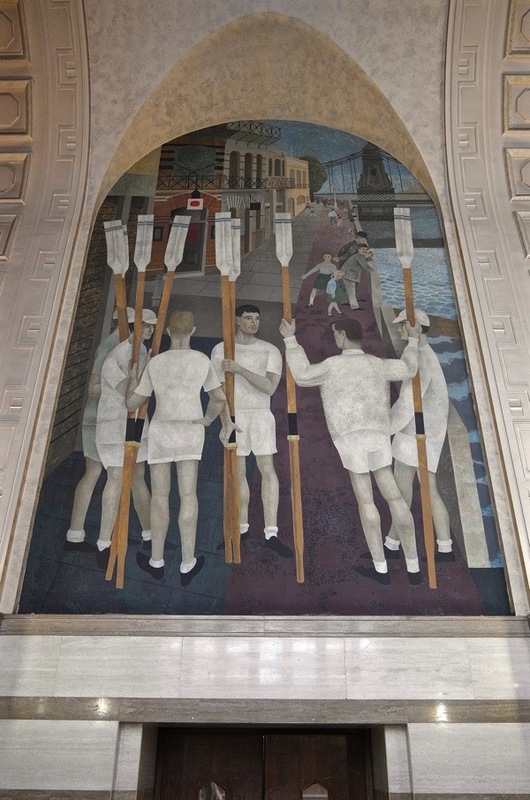 I would love to see these masterful 1950′s murals. Thank you for this, sent to me by a local resident in Hammersmith. You may be pleased to know that the modern extension in front of the Town Hall is to be cut back in size, the platforms and rigging removed and a square restored so that the Town Hall can be seen to better advantage. 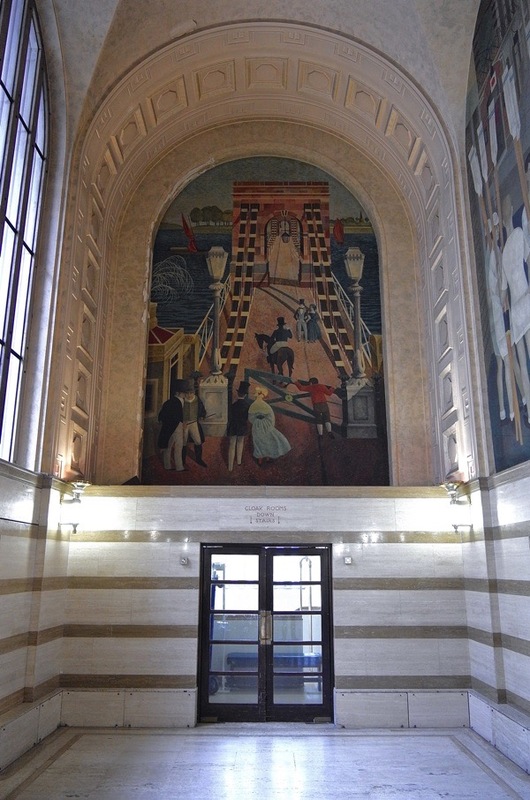 Ceremonial steps up to the first floor – and the Alfred Daniels’ murals – will be put in place. 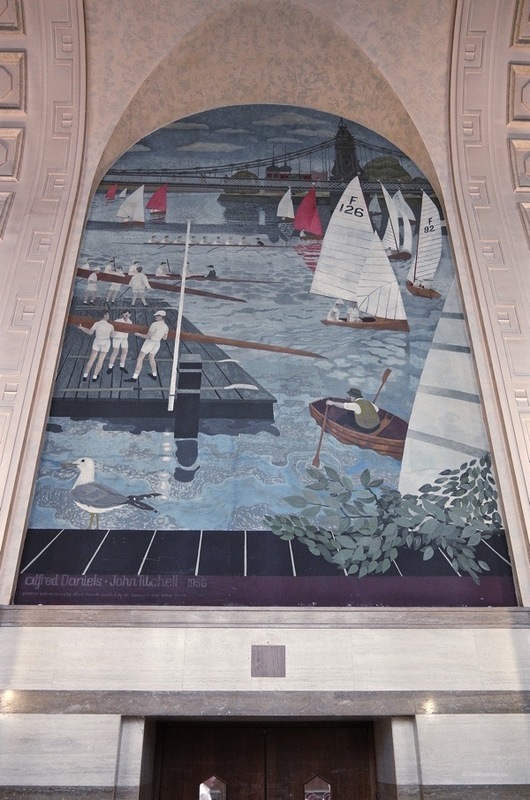 The mural on the west wall ~ with Thames barges & swans ~ is of Hammersmith Creek, which was once navigable as far as King Street & culverted in 1936. I got married at Hammersmith Town Hall, had a pub lunch at The Doves afterwards and took wedding photos on the pier. The Great West Road/A4/M4 approach road makes it hard to see the ways in which this quite charming bit of civic planning was supposed to look. The murals pay tribute to that, especially the Grand Union Canal which for some reason is the only one I remember with any clarity. Thank you. I see another book – murals of London – in my mind’s eye.